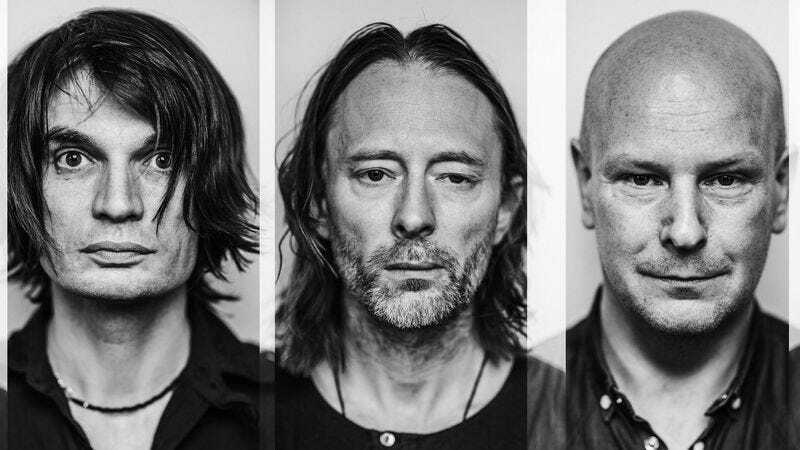 For a band that has so significantly reinvented its sound over nearly 25 years’ worth of recordings, the mood of Radiohead’s music has remained remarkably consistent—a mood that might best be described as “troubled.” A sense of unease and tension runs through nearly the entirety of the band’s catalog, from the jagged guitar blasts of “Creep,” to the snakelike guitar lines of “Paranoid Android,” on through the electronic pulses of “2 + 2 = 5” and the jittery rhythms of “Morning Mr. Magpie.” Radiohead’s soul has remained stubbornly grounded in anxiety, even (or especially) as its music has gotten more experimental and ambitious. Similarly, as a lyricist, Thom Yorke has returned to many of the same issues and obsessions time and again, even as his utterances became more elliptical and abstract, especially following the release of OK Computer. His concern with the environment, politics, and emotional weaknesses and fears run through all the band’s work, along with a knotty fascination with science, sci-fi, and end-times paranoia. A Moon Shaped Pool, the band’s difficult and downbeat new album, isn’t a profound reinvention or bold statement of purpose (à la Kid A or In Rainbows, respectively) so much as a discovery of how to integrate the varying elements of the band’s sound. The King Of Limbs felt half-finished, as though the group could see where it wanted to go, but wasn’t quite certain how to get there. Now those musical ingredients have come together, but the result is a more challenging listen. There’s no “Lotus Flower” here; instead, there’s an assemblage of nervy soundscapes, riven through with rhythms both languid and icily pulsing, that evoke a melancholic sensibility. The third track on the record, “Decks Dark,” captures well the overall tenor of A Moon Shaped Pool: It’s both downbeat and smooth, with a rhythm that manages the trick—constant throughout the record—of being simultaneously drowsy and hypnotically entrancing. Those qualities suffuse the music here, of which the most marked difference is the heavy addition of Jonny Greenwood’s string arrangements and the presence of a choir, both provided by the London Contemporary Orchestra. Greenwood’s soundtrack work, though a different beast, has (perhaps unavoidably) bled into the arrangements here. What felt incomplete or undercooked on Limbs now stands as a conceptual tactic, a means of creating musical pieces that are more like interconnected soundscapes than songs. Many of the tracks contain only one theme, of which the ensuing musical journey explores various permutations of that dominant concept. Songs expand or contract a single melody—or, more often, merely a motif—as though seeking to tease out the most compelling variant, before subsiding. Things like verses and refrains are mostly absent, so if the mood-music refinements of the last couple albums struck you as unsatisfying, there’s little here to intrigue. But for those willing to grapple with the headier pleasures of such experimentation, there are rewards buried among the moody meanderings. “Burn The Witch” is the closest the band comes to a more traditional song structure, and it’s easily the most immediate (and arguably best) track on Pool, the obvious choice for album opener. It’s followed by “Daydreaming,” the second song premiered in advance of the album’s release, and the two make an evocative case for the kind of transitions found throughout. It pivots from the former’s all-tension-no-release buildup to the soulful, searching mood of the latter, built upon a piano progression of almost Philip Glass-like simplicity and repetition. “Dreamers, they never learn,” Yorke croons, “It’s too late, the damage is done.” This isn’t a tribute to the dreamers, it’s a death sentence. As swirling synths begin to overtake the melody (a regular occurrence on Pool), the sounds spiral upwards, and it’s like watching a funnel cloud take shape. From there, the mood of general anxiety and unease threads together the various tracks, but with an air of loss and melancholy draped over all of it. (Those who find intrigue in locating the source of artistic output in direct personal histories will no doubt find many dots to be connected between the album’s content and Yorke’s recent separation from his partner of more than 20 years.) “Desert Island Disk” is the most distinctive offering, musically speaking: It lopes along on a faint pulse of a beat and almost flamenco-style acoustic guitar, with synths washing along the main melody, until the drums arrive, and it makes a sharp left turn. “Different types of love / are possible,” sings Yorke, and the track ends as music for late-night jazz clubs, or a smoky piano bar. “Ful Stop,” by contrast, just builds and builds, a jittery skitter of a song with pleading vocals about wanting to be taken back. “All the good times” is wailed, to such a degree that “all” sounds like “ow,” as though the narrator is pained by even happy memories, now. It’s a steady, assaultive pattern, like someone trying to outrun their own thoughts. The back half of the album offers no respite from the disquiet. “Glass Eyes” is a languorous, almost sweet piano run, as Yorke conveys a narrative of someone going for a walk with no sense of destination or purpose. “Identikit” provides a short, stutter-stop rhythm and minor guitar melody, until Colin Greenwood’s bass line amplifies the tone of the song. “Broken hearts, make it rain,” goes the repeated phrase in the middle of the proceedings, and it’s unclear if the sentiment is a request or a declaration, as the choir picks up the call and frantic guitar work carries it to a spastic conclusion. The acoustic guitar returns for “Present Tense,” the emotional centerpiece of the record, with Yorke painting a picture of a man putting on a brave face as he drowns in loss. “All this love has been in vain,” he proclaims. It’s a deeply sad song, one that hides its pain in the sweet harmonies and gentle melodies and rhythms of its music, something of a recurring theme for the band as a whole, not just in this latest release. “True Love Waits,” a number that’s been around in a more traditional form in the band’s live act since the era of The Bends, here is fashioned into an elegiac piano composition, the track’s haunting refrain of “don’t leave” now hitting with the force of a coffin lid slamming shut. It’s an apropos conclusion for a record that constantly feels on the verge of slipping into despair. 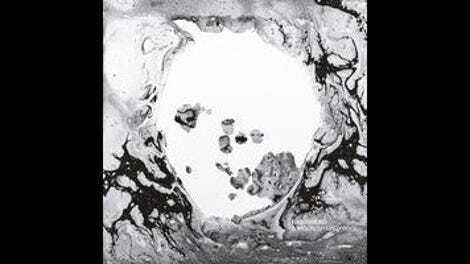 With the rhythm section’s snaky, pulsing beats, and guitars expanded by electronic sounds pressing outward against the constraints of the organic instruments, A Moon Shaped Pool is the sound of Radiohead trying to imbue personal attachment to a world that feels as though it’s lost such connections. It pauses, in awkward fits and starts, even as the overall experience is languid and repetitive, like the daily grind of life itself. The band has figured out how to translate its worldview into an album of tone poems, a record of songs ending in abrupt drops or trailed-off codas, as though each effort—by definition, you get the sense—must inevitably come up short.